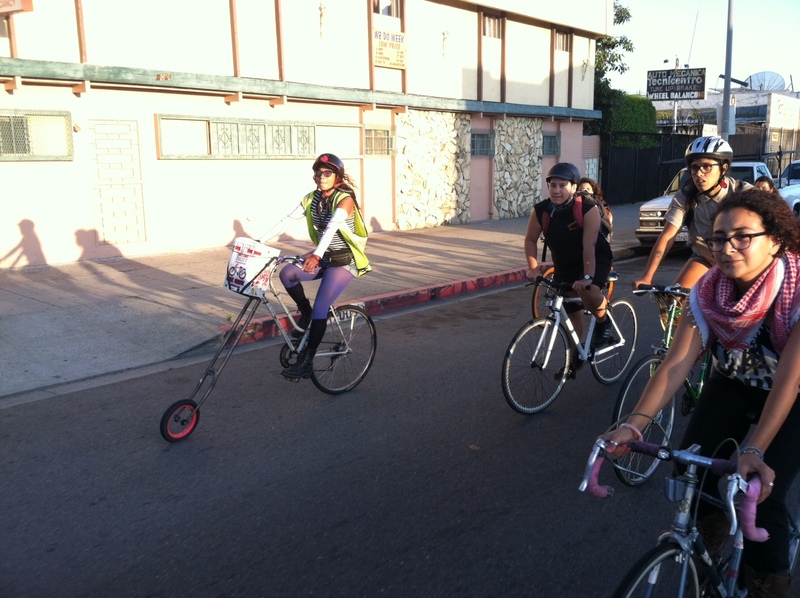 “How many of you have ever been here to the Watts Towers before?” asked one of the young women inside the growing circle of women cyclists who gathered to participate in the Ovarian Psyco-Cycles’ Second Annual Clitoral Mass. By the time we arrived, about 60+ women of varying ages and backgrounds had already gathered in the plaza next to the towers. I spotted familiar faces as I joined the circle. A few curious neighbors peered from their windows while others stood outside watching from their yards. Soon a group of local young men on bikes began to circle around us, eyes scanning each of us as if marking their territory. The air was thick with an uneasiness that dissipated into calm once the blessing ceremony began in earnest. The small group of young women wearing long flowing skirts that had gathered at the center of the circle began to fill the plaza with the smell of burning sage as they “smudged” riders and their bikes with sage smoke. One of the women then began to lead the circle in a ceremony that connected riders and spectators as we gave thanks and gathered strength from the four cardinal directions as well as the sun. Moon. The earth. And sky. “We look to the east first. The place of the Sun and our brothers. We ask for our brothers behind bars, incarcerated by this system, separated from us…” As the young woman spoke the young men that had been circling us stopped, listened, and turned their bodies east in unison with the circle of women, setting the tone for the 30+ mile journey. I did not participate in the Ovas’ (as the Ovarian Psycho-Cycles are known) First Clitoral Mass. And although I have followed their work, I had not participated in any of their Luna rides. In fact as I talked to participants at rest stops, there were many newbies in the crowd that evening. For many of us this was not only our first “BIG” ride but our first experience in an all women (“womyn, womyn-identified, two-spirited, trans & gender-variant folx”) event. 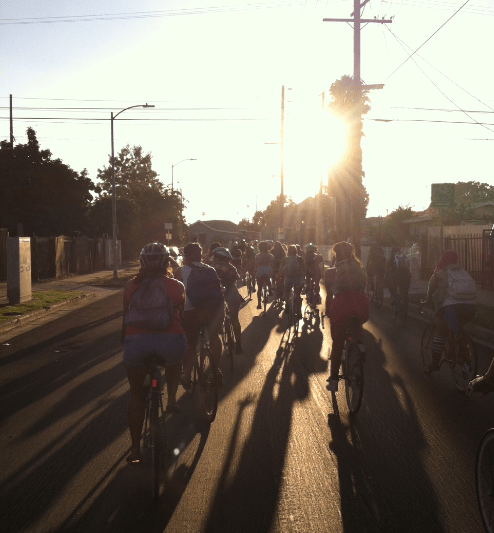 The beginning of the ride took us through South L.A. neighborhood streets where Saturday evening fiestas were in full effect. Canopies out front, in driveways, decorated with puffy tissue flowers, conjunto music blasting. A man in a cowboy hat and boots tried to gain control of a young and very freaked out horse as riders took to the sidewalks. The air filled with electricity, magic, smiles, and cheers. Women, men, young and old ran out to see what was happening. Double takes, triple takes, mouths dropping, cheers, “Mira! Son puras mujeres!” (Look! They are all women!). Riding through some of the main arteries of South L.A., older African-American men came out to the street extending their arms out palms open to high five riders as we passed by. Young girls smiled, drivers honked in support, and older women cheered us on. “I want to come with you! Take me with you!” hollered a woman. An incredible amount of support filled the streets of South L.A., building the adrenaline of newbies and expert riders alike. There was nothing stopping us now; a sense of empowerment filled us all. 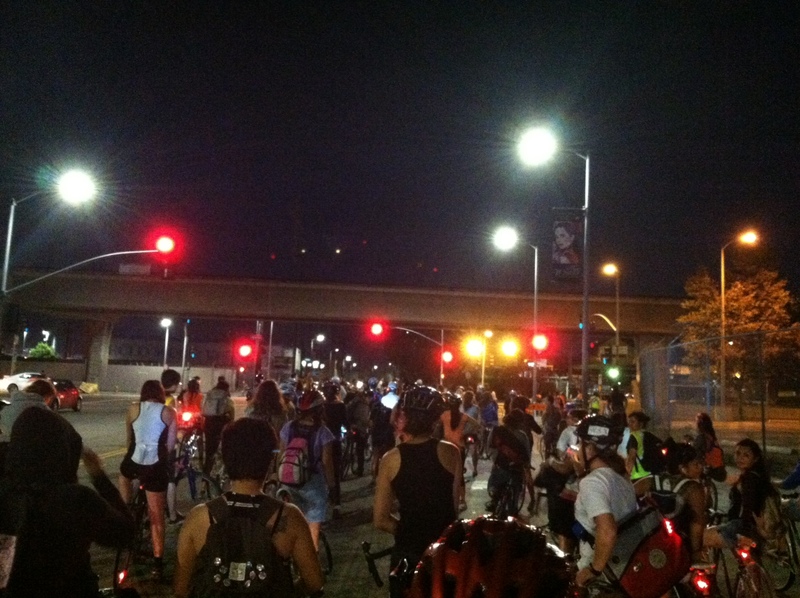 To ride with so many women felt good, felt safe, it felt like we could take on anything that came our way. Drivers slowed down to ask our destination. Time and time again riders would answer “from Watts to Pasadena, from Pasadena to Boyle Heights,” a look of utter disbelief and amazement would fill the faces of those who had asked. Bells rang as we waved at little girls watching us from the sidewalks as if to say, you, too, can do anything. Arriving at our first rest stop at Fremont High, male allies served up slices of oranges, filled canteens, distributed sliced-up peanut butter sandwiches. The all-female security team along with the Santa Ana Cop Watch team gathered to regroup. Recognizing the range of riders the organizers made a critical decision. New and un-experienced riders were asked to move to the front of the pack to set the pace while experienced riders were asked to follow behind. Before we headed out again, I noticed three women, one with an older beat-up cruiser. I myself ride an old 1970’s purple cruiser with a basket out front and a rusting bell on my right handlebar. Nothing fancy, a joke to any bike enthusiast, so I felt an instant connection with this particular group of riders. I asked how they had heard of the ride. Claudia explained how she had been on a call just a few hours before with members of an immigrant youth coalition when someone mentioned the ride. Claudia along with her sister Joana and friend Maritrini finished the 30+ mile ride from South L.A. to Pasadena, to Boyle Heights. Agreed! Makes me want to be one of the guys handing out oranges next time to support this great event!